Make sure that if you add extra resistance in the form of ankle weights or bands, you feel it more in the glutes. The purpose of additional resistance is to increase the load on the glutes, but if you go too heavy, you don’t achieve this goal and you end up feeling it more in the hamstrings and erector spinae. Bodyweight is sufficient for many lifters. If ankle weights overly challenge the ability of your hamstrings to stabilize the knee joint, then you’re not yet ready for extra loading. When using bands, you want an upward vector so that there is tension pulling down on the hip, thus requiring end range hip extension torque. So make sure the bands (or cables) are positioned low in relation to the torso. Beginners need to master slow tempos before performing rapid tempos. Toy around with these and figure out what works your glutes the best. 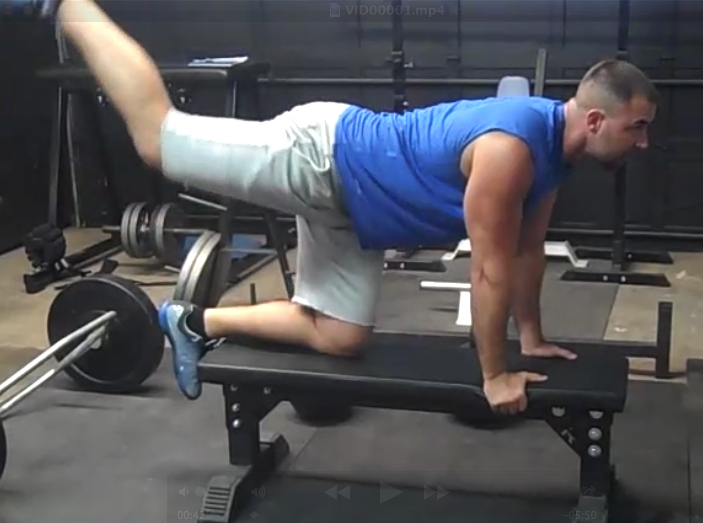 Some do best with rapid dynamic movements, some do best pausing at the top of each rep, some feel the glutes more during hip transverse abduction when they internally rotate their hip, and some can move into hip hyperextension without irritating the low back whereas others need to stop a bit short. Hat tip to frequent guest contributor Derrick Blanton for reminding me about this surprisingly effective exercise. The post Quadruped Leg Swings appeared first on Bret Contreras.